Hey guys, so my brother was watching a T.V. show called 'F.R.I.E.N.D.S' and he found BIONICLE cameo's in it! So, it begs the question, how many things have you seen, heard, touch, tasted or smelled Bionicle in non-Bionicle stuff? Nice one you've found, @Middlefingerstudios. I think that BIONICLE has been "mentioned" here because DC was publisher for bonkles comicbooks. I'm pretty sure some Mistika and Phantoka sets had a cameo in a terminator show. I've heard that before as well. 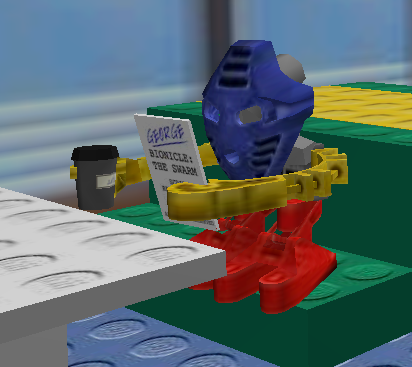 The Bionicle is a toy franchise manufactured by LEGO Group. John Henry seems to enjoy playing it. John Henry plays the Bionicle sets from 2008. John expresses interest as well as envy due to the highly articulate ball joint within the toy. "The Good Wound"
Someone found a scene in The Sarah Connor Chronicles show (I think that's what it's called) where some guy is playing with Tahu and Gali Mistika. I also saw an episode of this other show called Suburgatory where a kid was playing with Takanuva Stars. There was this movie I saw a long time ago, and some kid was playing with the Vahki in it. Wish I could remember the name though. Funny thing, that episode is what got me back into Bionicle. I think there were a few in the background in either Spy Kids 2 or 3, as well as that really bad remake of The Day the Earth Stood Still. GAH, WHY DOES EVERYONE THING THAT AN APOSTROPHE MAKES SOMETHING PLURAL?!?! IT MAKES IT POSSESSIVE IN MOST CASES NOT COUNTING IT'S, WHICH IS A CONTRACTION! Anyway, I can't think of any as of now, although I'm sure I've seen them. Can someone point to me what was the episode in "King of Queens" where Dug and Debby go to buy some toy for their friends kid and in the toy shop you can see Bionicle 2001 canisters? Wait, did he really have his info right too?